Over the past fifteen years, the satellite channel GOD TV has emerged as one of the most significant players in global charismatic Christianity. It began in the UK, bringing the likes of Fred Price and Creflo Dollar (whom I blogged on here) to British audiences, but its reach is now international and its founders – Rory and Wendy Alec – enjoy support that ranges from Benny Hinn, Rick Joyner (blogged here), and Cindy Jacobs (blogged here) in the USA through to RT Kendall, Colin Dye (blogged here), and Matthew Ashimolowo in the UK, Ulf Ekman in Sweden (blogged here), and Paul Dhinakharan in India (blogged here). Although the Alecs were brought up in the Rhema movement in South Africa, which emphasises the Prosperity Gospel, their channel showcases a wider range of Charismatic beliefs. In particular, there is an apocalyptic drama penned by Wendy Alec entitled Chronicles of Brothers, which promotes “New World Order” conspiracy theories, and an emphasis on Christian dominion of society – Wendy Alec’s book Against All Odds includes a prophecy about the rise of a Christian ruler of Britain who will rule “with a rod of iron”, and that, following a “wave of prayer” on the east coast of the USA, there will be a joining of “the lion and the eagle”. God TV is incorporated as a nonprofit in the U.S. under the name Angel Christian Television Trust, and has regional offices in the U.S. including a base in Grandview, Missouri, near Mike Bickle‘s International House of Prayer (IHOP) headquarters (outside Kansas City, MO). The Alecs bought a historic estate in that area in 2009. Several programmes broadcast by GOD TV have been noted by Right Wing Watch. 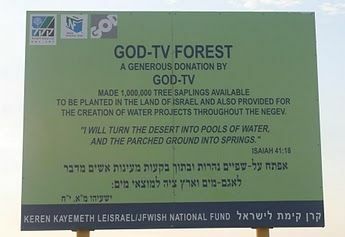 As the only TV network to broadcast globally from Jerusalem, GOD TV recognizes the modern State of Israel as a fulfillment of Bible prophecy and supports the Jewish people through projects such as its ‘One Million+ Trees for Israel’ campaign. In particular, GOD TV gives a platform for John Hagee, whose apocalyptic Christian Zionism drips with conspiracy theories about the “Illuminati” and such, and whose theology infamously includes the notion that Hitler was a “hunter” sent by God to persuade the Jews to move to Israel. At the beginning of the 1950’s, Israel evacuated by force the Bedouin living in el Arakib, north of Beer Sheba. The evacuees were told that their lands were needed for military exercises, and promised that within six months they would be allowed to return to their village. This promise that was not kept. Instead, by means of the Land Purchase Legislation of 1953, various government agencies used the forced absence of the Bedouin from the area to transfer ownership of their lands to the State. Nuri al-Okbi, the head of the Association for Protection of the Rights of Bedouins, is currently in prison for running a garage without a license – Judge Zachariya Yemini is quoted as having handed down a custodial sentence because “treating the defendant leniently would constitute a negative message to the public, and especially to the Bedouins”. He told me that while they are planting a million trees to beautify the land for the Second Coming of Christ, he knew nothing about Al-Arakib. “The JNF hasn’t told us anything about that and we certainly wouldn’t be a part of anything that would do what you described,” he said. Then he demanded I support my claims with evidence. I asked if he ever spoken to a Bedouin or gone to the Negev to see the situation for himself. He said he hadn’t… “I noticed in Holland a lot of people said they were Christian but they didn’t even go to church, so I realized that they were not really Christians. I mean, what kind of Christians are these Palestinians?” Klaas said. He seemed to be suggesting that anyone who was not born-again was not an authentic Christian.